We are a small company serving the Northern Virginia area building and installing custom built as well as ready to install cabinetry, interior trim and other woodworking projects. 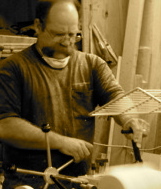 C&G Woodworking has been in business since 1996. Craig has been involved in all phases of carpentry for over 30 years, Kevin for 17 years and Travis for 15 years. Some of those we have done work for include Yorktowne Cabinetry, Schroeder Design/Build, Hylton Group and Pighini Builders. FACEBOOK You can find more pictures on our Facebook Page.